Mosquitoes and aquatic gnats are part of the insect Order Diptera, the name describing the fact that the adults have two wings rather than four wings as most insects. These true flies are part of the largest and most highly evolved of all insect orders. Fly patterns in this section include other members of the order such as crane flies, black flies and any other fly pattern that does not fall into the categories of; caddisflies, mayflies and stoneflies. Although the number of recipes is sparse in this section it is none the less important to anglers and fly tiers. The diminutive size of these naturals makes tying imitations necessary in the hook range of sizes 18-22. Imitations of mosquitoes and aquatic gnats smaller than hook size 22 are very difficult to tie and more importantly create an unrealistic looking fly. The Griffith's Gnat is one exception as it is tied down to a size 26. 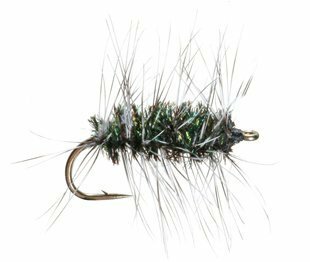 California Mosquito Pattern Recipe: Hook- TMC100 sizes 12-20, Thread- Black 6/0, Tail- Grizzle hackle fibers, Rib- White silk thread, Body- Black floss, Wing- Grizzle hackle tips, Hackle- Grizzly wound collar style. Mosquito Pattern Recipe: Hook- TMC100 sizes 12-20, Thread- Black 6/0, Hackle- Grizzly wrapped collar style, Wings- Grizzly hackle tips tied upright and separated, Body- Light and dark moose hair wrapped together, Grizzly hackle barbs.